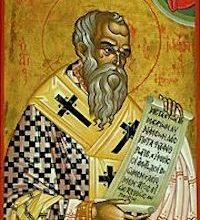 The deacon is the lowest of the three ranks of the priesthood (deacon—priest—bishop). 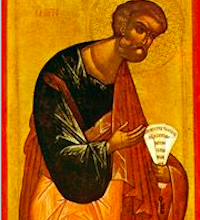 The word deacon (διακονος) means server. The first historic account of deacons is found in the Book of Acts, chapter 6. The earliest community of Christians was living together and sharing everything. A dispute between the Hebrew Christians and Hellenic Christians started to drive a stake through the heart of the community. The Apostles decided to appoint seven men to serve the community. Their names were Stephen, Philip, Prochorus, Nicnor, Timon, Parmena and Nicolas. The Apostles prayed and laid their hands on them (the first ordinations!). 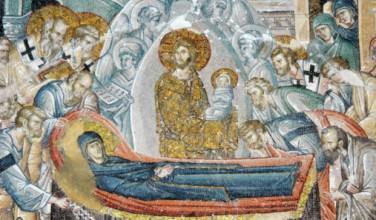 By the time the Apostles had fallen asleep in the Lord, the deacons became a more prominent order of the Church. Initially when you were ordained to one of the orders of the priesthood, you maintained that position for life, there wasn’t the upward movement we see now, where a bishop has to have been a priest and before that a deacon. They were allowed to read/chant the Epistles and Gospels, assist or dispense communion, and guide the prayers of the community. The deacon also calls to attention the people, either to stand or pay attention. A deacon is not permitted to serve communion to a higher-ranking clergy (priest or bishop). A deacon cannot do any liturgical service by himself, but would need a priest or bishop to act in a service. If a deacon wishes to be married, he must be married before he is ordained. We don’t see much of deacons today, but they are still maintained as an order of the Church and have a specific function when they are present. Deacons lead most of the petitions (the part of the services where we ask God for things and respond with Lord have mercy or Grant this O Lord). They wear different vestments than both priests and bishops. He wears a sticharion, epimanikia, and orarion. Deacons do the “grunt work” of the liturgical services, such as carrying and using the censer, as well as carrying and sometimes reading the gospel. In services where deacons are not present (as is the usual case, especially here in America), the priest will do the readings, petitions and such, but the priest will not exit the altar to read/chant the petitions. 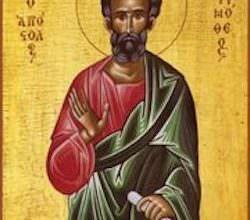 The deacon is seen today as a blessing, but not as a necessity. The rise of the presbyters/priests lowered the amount and need for deacons. Yet, one can only imagine what a beautiful liturgy at Hagia Sophia in Constantinople would look like with its multitude of clergy, even many deacons. Among deacons we can find many different titles. One title is Protodeacon, who is the chief deacon of a cathedral. Another is Archdeacon, who is associated with a bishop. We see this very often, as such with the Archbishop. Many times outside of the liturgical duties, such archdeacons will be found driving their respective Bishop and usually is as close to the bishop during ministry as a shadow is to all of us. A deacon who is also a monk is called a Hierodeacon.